Over the last few years, I’ve been hearing many good things about Betfair Casino online, so I thought I would give it a shot. First, let me give you a little bit of information on Betfair itself. Betfair was founded in 2000, by Andrew Black and Edward Wray. They teamed up to create Betfair’s Exchange, which enables customers to bet against each other rather than going through a bookie. Operating online since 2000, Betfair uses the latest version of reliable, easy-to-install, state-of-the-art Playtech software. It is also playable on mobile devices, offering a large variety of both slots and table games,as well as live dealers. I have also experience exceptionally high payouts for all the games I tried out. Today, Betfair still runs its betting exchange, as well as a full suite of online gaming and sports betting. Betfair has one of the largest online gaming selections I have ever come seen. I’m talking… blackjack, roulette Texas HoldEm, craps and so much more. Plus, with over 24 different sporting events to bet on and well over 40 casino games for you to play, there’s always something to do when you log in. Oh, and did I mention they offer online poker as well? Betfair is the world’s largest betting exchange and its online casino is an amazing innovation that offers the customer LIVE action. 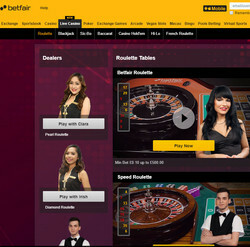 Betfair Casino has gone one step further, immersing its users in an authentic real world casino experience. 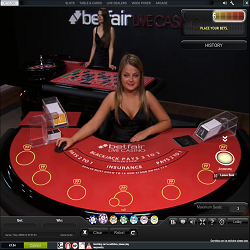 The Betfair Live Casino offers Live Roulette, Blackjack, Baccarat, Texas Hold‘em poker and more. I’m talking… an actual live dealer on the other side of the screen. No pre-recording, this is an actual person dealing you your cards, live. These dealers are also online 24/7. There are two versions of Blackjack available; the traditional 7-seater table and the extra player format, which allows for an unlimited number of players to sit down at one table simultaneously. Or you could play the ever-popular Roulette with your very own live dealer. Here you can play the European format of the game – the most popular set up. The Live Roulette room offers high definition graphics and a full screen option. This is about as realistic as you can hope to get on your computer screen, I guarantee it. Betfair Trading Software makes betting exchanges easier for you. Secure gaming is a priority of Betfair, offering a variety of different security measures when it comes to their system. 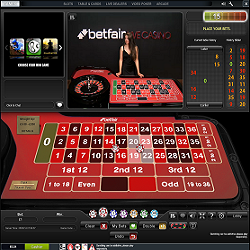 Players are safeguarded from others reading their secret data with Betfair Casino’s 128-bit SSL encryption. Once the data is on their servers, it is protected with the latest in firewall technology and other computer safety systems. Betfair owns a large in-house agency who provides everything from their entire infrastructure to the software itself. This gives them the flexibility to innovate the most advanced software and games, at the highest levels. Betfair Casino uses Playtech games. Since Playtech is the largest online casino game distributor, with a giant slot selection. Betfair Casino offers some of the most legendary games, including the ever-popular Marvel series slots. Every video slot contains its own unique paytable, with some even having completely random elements. With plenty of three-reel games to boot, slot players can certainly get all their thrills with Betfair. 100% on the first deposit limited to £200 valid only for live games. Several other promotions aimed at all players as well as different VIP offers are also often on offer on Betfair Casino. Betfair offers countless mobile products, including E-sports, live mobile betting, mobile arcade games, mobile racebooks, mobile sportsbooks and mobile casino games. So, even if I go away on business, I can still have the opportunity to play. Not bad at all. Betfair’s customer service is pretty solid as well. They over 24/7 online chat feeds, where they promise to answer your question in 30 seconds or less. I tried it a few times, and each time came in under 30 seconds. They also offer a 24-hour email service, in which they will reply within 2 to 4 hours. Lastly, they offer their telephone services and betting system that is manned 24/7 by English speaking representatives. All in all, Betfair Casino is a solid gambling site. They have a huge selection of games to play and sporting events to bet on, so you will never get bored if you like to gamble. 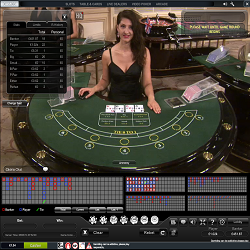 Their live dealer option is a really innovative feature that more sites should use. Unless you’re a new player, they don’t have many promotions running at the moment, but that could change. This place is a one-stop-shop for online gambling excitement, and if you haven’t already, you should definitely check it out.